The 4th of July always sneaks up on me, maybe its because we go to Nashville to visit family the last week of June (we are leaving this Wednesday) or because it’s at the very beginning of the month, but either way I’m normally just not prepared. 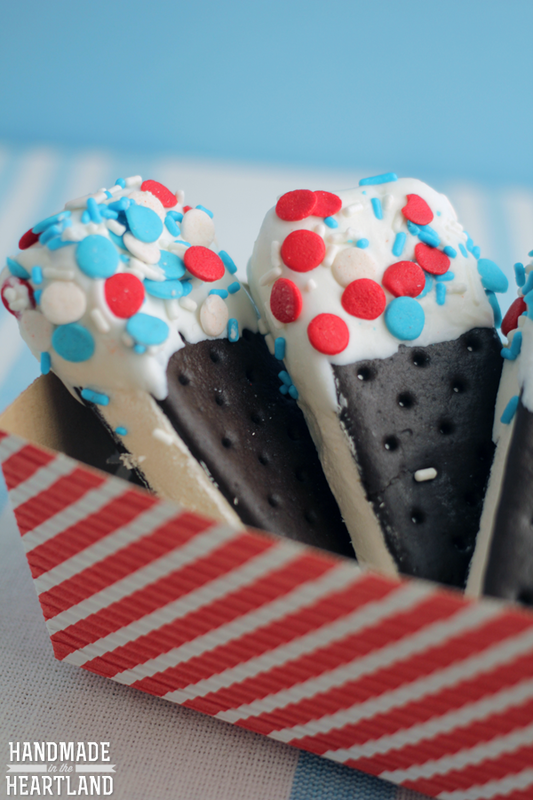 This year I have been working on coming up with some fun ideas for the 4th to share with you, did you see the firecracker dogs the other day? so fun. 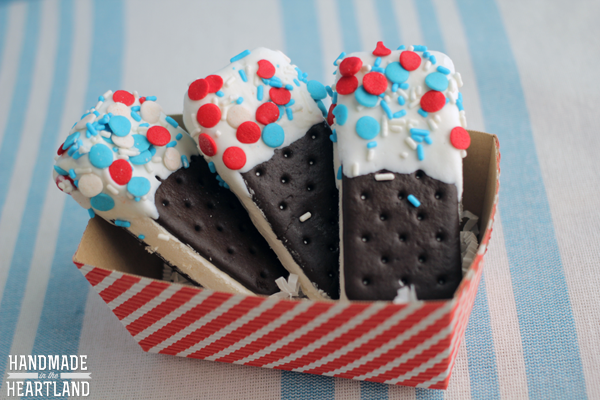 So how cute are these mini ice cream sandwiches?! totally cute is the answer. 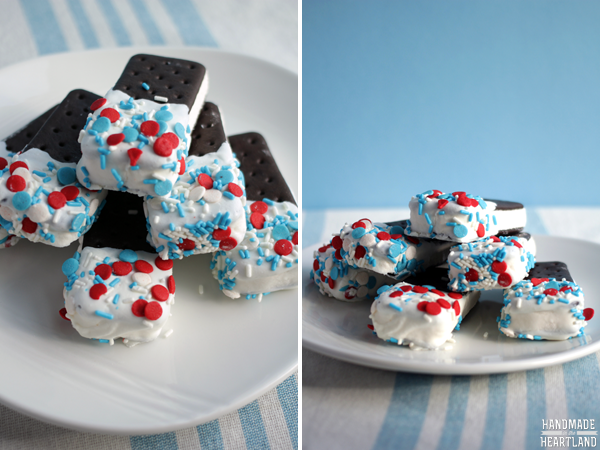 🙂 These fourth of july ice cream sandwiches are super simple to make and so fun, again you’ll totally be the coolest mom at the picnic. A great thing about these little guys is that you can make them as far in advance as you need to. 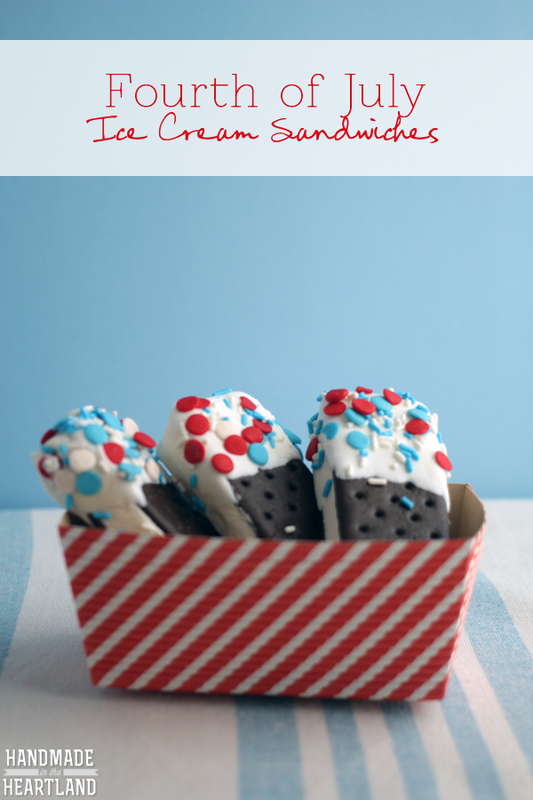 If you’re taking them to a party or bbq you could make them and then wrap them in parchment paper or stick them in cute little paper treat bags, just make sure to distribute them before they melt! Melt the candy melts in a bowl in the microwave in 30 second increments until nice and creamy. 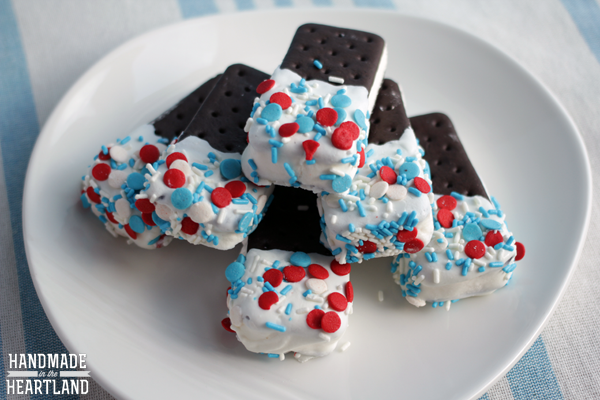 Take your ice cream sandwiches out of the freezer, dip them in the white candy coating and then immediately decorate with sprinkles. I like to have a plate ready with the sprinkles already on it so I can just dip the sandwich on the plate instead of sprinkling it out of the container. I also mixed a few different types of sprinkles to create a fun look. Place the sandwiches back on your silpat and put in the freezer to harden up again. Work quickly so the ice cream sandwiches don’t soften that much. If you are making a lot of them I would only take 5 or so out of the freezer at a time. What are your plans for Independence Day? 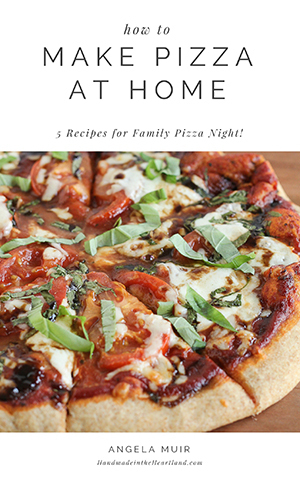 Do you have family traditions that your family counts on? I’d love to hear your fun plans in the comments!